I hope everyone enjoyed the short story! Next week we resume with our regular updates. 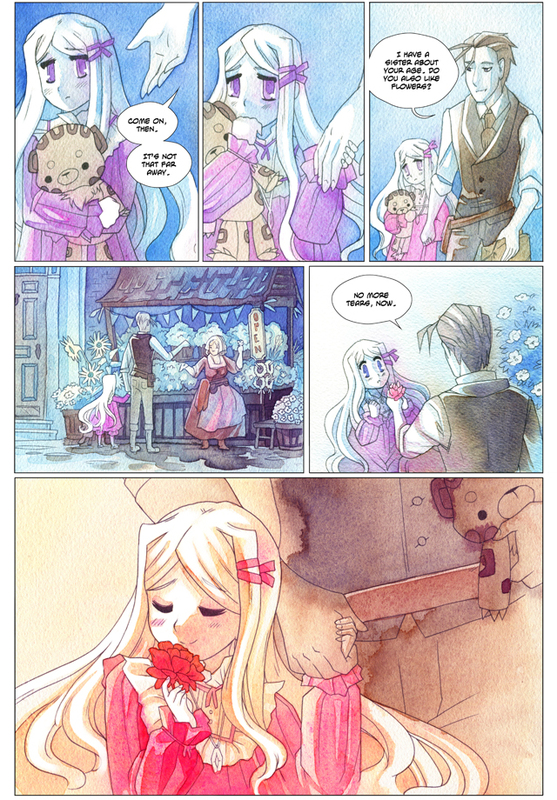 I was thinking about posting word bubble-less pages on DA and linking to come read it here. Should I do or would you rather keep the pages just here? A gorgeous story all around, Amanda and Cari! Thanks so much to both of you! I can’t wait to see it in print. This short story takes place 5 years after Vincent’s short story. Adorabella was seven in his tale, and Faye is seven here. See, the sad truth is Vincent never saw his family again after he left- so even though Adorabella is now twelve, she will always be seven when he thinks of her. You are an angel, and a devil too. I like the evil glimmers between the tear drops. No really excellent job, but one thing. I wanna see what happens to Amelia when she gets home. And now, because it’s not hard to get me to think too much, I’m going to puzzle over the possible significance of those flowers. Lovely story! Great job, Amanda and Cari and Savvy! Well having the author calling it a childhood crush at least settles the worry I had when I read the page, which was “good samaritan or pederast”? I love the way the background color shifts with her mood. It is beautiful. Wait… Vincent?! … That incorrigible flirt is Vincent?